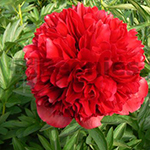 This variety has the largest blooms of all the ones listed here and probably of all the herbaceous peonies around. Truly huge, full double and dark red flowers of the bomb-type. Technically ‘Red Grace’ is of the same red color as ‘Red Charm’, but the flower is so tightly petaled it’s almost a complete globe wich makes it seem like a very dark red. The unusual ball-shaped flowers are carried well by massive stems with no side buds. Very exclusive and hard to get. Insiders sometimes call ‘Red Grace’ the superlative of ‘Red Charm’.